Concerned in Deaths of John and Jesus. Seventh (not sixth, as stated in Graetz, nor third, as in Dean Farrar's biography of the Herods) and, at the time of his father's death, youngest son of Herod the Great by his Samaritan wife, Malthace. The exact date of his birth can not be ascertained, but it must certainly have occurred before 20 B.C. He died in exile about the year 39. Antipas, like most of the other members of his family, was educated at Rome, and kept in close touch with the imperial court. Little is known of his mode of life or of his activity before his accession to power, though his later acts do not lead to the supposition that he had been superior in virtue to his half-brothers, or, indeed, to most of the patrician youths brought up near the palace. From two Greek inscriptions—one from the island of Kos, and the other from Delos ("C. I. G." No. 2502; "Bulletin de Correspondances Helléniques," iii. 365)—it is apparent that he traveled extensively, though it can not be ascertained at what period of his life. Upon the discovery of Antipater's attempt to poison his father, Herod the Great appointed Antipas his successor to the throne of Judea; but either, as some state, on account of the severe illness that had again befallen him, or owing to the fear of dire consequences in leaving the whole kingdom in the hands of his youngest son, Herod divided Judea into several districts, and in his last will (about 4 B.C.) 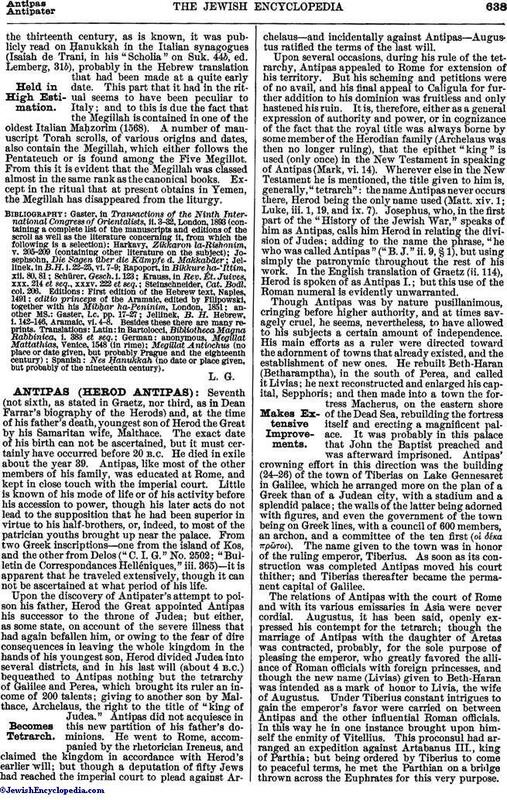 bequeathed to Antipas nothing but the tetrarchy of Galilee and Perea, which brought its ruler an income of 200 talents; giving to another son by Malthace, Archelaus, the right to the title of "king of Judea." Antipas did not acquiesce in this new partition of his father's dominions. He went to Rome, accompanied by the rhetorician Ireneus, and claimed the kingdom in accordance with Herod's earlier will; but though a deputation of fifty Jews had reached the imperial court to plead against Archelaus—and incidentally against Antipas—Augustus ratified the terms of the last will. Upon several occasions, during his rule of the tetrarchy, Antipas appealed to Rome for extension of his territory. But his scheming and petitions were of no avail, and his final appeal to Caligula for further addition to his dominion was fruitless and only hastened his ruin. It is, therefore, either as a general expression of authority and power, or in cognizance of the fact that the royal title was always borne by some member of the Herodian family (Archelaus was then no longer ruling), that the epithet "king" is used (only once) in the New Testament in speaking of Antipas (Mark, vi. 14). Wherever else in the New Testament he is mentioned, the title given to him is, generally, "tetrarch": the name Antipas never occurs there, Herod being the only name used (Matt. xiv. 1; Luke, iii. 1, 19, and ix. 7). Josephus, who, in the first part of the "History of the Jewish War," speaks of him as Antipas, calls him Herod in relating the division of Judea; adding to the name the phrase, "he who was called Antipas" ("B. J." ii. 9, § 1), but using simply the patronymic throughout the rest of his work. In the English translation of Graetz (ii. 114), Herod is spoken of as Antipas I.; but this use of the Roman numeral is evidently unwarranted. Though Antipas was by nature pusillanimous, cringing before higher authority, and at times savagely cruel, he seems, nevertheless, to have allowed to his subjects a certain amount of independence. His main efforts as a ruler were directed toward the adornment of towns that already existed, and the establishment of new ones. He rebuilt Beth-Haran (Betharamptha), in the south of Perea, and called it Livias; he next reconstructed and enlarged his capital, Sepphoris; and then made into a town the fortress Macherus, on the eastern shore of the Dead Sea, rebuilding the fortress itself and erecting a magnificent palace. It was probably in this palace that John the Baptist preached and was afterward imprisoned. Antipas' crowning effort in this direction was the building (24-26) of the town of Tiberias on Lake Gennesaret in Galilee, which he arranged more on the plan of a Greek than of a Judean city, with a stadium and a splendid palace; the walls of the latter being adorned with figures, and even the government of the town being on Greek lines, with a council of 600 members, an archon, and a committee of the ten first (οἱ δήκα πρῶτοι). The name given to the town was in honor of the ruling emperor, Tiberius. As soon as its construction was completed Antipas moved his court thither; and Tiberias thereafter became the permanent capital of Galilee. The relations of Antipas with the court of Rome and with its various emissaries in Asia were never cordial. Augustus, it has been said, openly expressed his contempt for the tetrarch; though the marriage of Antipas with the daughter of Aretas was contracted, probably, for the sole purpose of pleasing the emperor, who greatly favored the alliance of Roman officials with foreign princesses, and though the new name (Livias) given to Beth-Haran was intended as a mark of honor to Livia, the wife of Augustus. Under Tiberius constant intrigues to gain the emperor's favor were carried on between Antipas and the other influential Roman officials. In this way he in one instance brought upon himself the enmity of Vitellius. This proconsul had arranged an expedition against Artabanus III., king of Parthia; but being ordered by Tiberius to come to peaceful terms, he met the Parthian on a bridge thrown across the Euphrates for this very purpose. Here Antipas prepared a magnificent tent for them and entertained them sumptuously; but before Vitellius could inform the emperor of the negotiations the tetrarch had sent messengers to Rome with the necessary despatches. The exact date of the meeting between Vitellius and Artabanus has been the subject of much dispute, and is still a moot question. Antipas was continually intriguing against Pontius Pilate also. At one time Antipas sent a complaint to the emperor against Pilate because the latter had put up an unwelcome votive tablet in the palace of Jerusalem (about 36). Nor was Antipas popular among the Judeans. It is true that, at least ostensibly, he complied with the more important ordinances of the Jewish faith, and that he went to Jerusalem to celebrate the feasts. But the house of Herod had become an object of hate and suspicion; and Antipas himself had done nothing to counteract the spreading of these sentiments. On the contrary, he had adorned his palace walls with the figures of animals, even though there had been no effigies on the coins he minted; and, above all, he had violated the Mosaic law in marrying Herodias. John the Baptist denounced him publicly (Matt. xiv. 4; Mark, vi. 18); and even Jesus called him "that fox" (Luke, xiii. 32). In the history of the Messianic movement Antipas plays a most important part; for he is the Herod of the Gospels who slew John, and who was partly responsible for the execution of Jesus; though the story of the presentation of John's head on a charger, by the daughter of Herodias, is probably an exaggeration. It is possible that John's imprisonment and death were inspired by Herodias, whose marriage, as has been said, he had denounced. Antipas' part in the fate of Jesus consisted in the preliminary hearing of the latter; for Pontius Pilate, to whom the accusations against Jesus were brought, handed over the preacher of Galilee to the tetrarch of that district, who was then sojourning in Jerusalem. Jesus answered neither the charges of his accusers nor the questions of Antipas; and he was handed back to the higher authorities, to be tried according to Roman law and custom. Antipas married twice, his first wife being the above-mentioned daughter of Aretas VI., king of Arabia Petræa. During one of his visits to Rome he met Herodias, his own niece and the wife of his half-brother Philip, and persuaded her to leave her husband and to accompany him to Tiberias. His Arabian wife, upon hearing of her impending disgrace, obtained permission from Antipas, on the plea of ill health, to go to Macherus, which then belonged to Aretas; and there she met her father, whom she induced to pick a quarrel with her husband and to invade his tetrarchy. Antipas' army was defeated, and his lands were threatened (37). He was obliged to order Vitellius against Aretas; but before the Roman proconsul had left Judea the emperor died; and Vitellius, in revenge for Antipas' treachery on the occasion of the peace negotiations with Artabanus III., promptly desisted from his march. Fortunately, Aretas withdrew to his own lands. Antipas' marriage with Herodias was neither of long duration nor very happy. She was ambitious, and wished to see her husband in the possession of greater territorial power. After the death of Tiberius she induced her husband to make a personal appeal to the new emperor for the possession of the royal title; but Agrippa, whose first appointment to imperial function (as overseer of the markets) had been brought about through the influence of Herodias and Antipas, sent a messenger, Justinianus, to Caligula, who was then at Baiæ, and accused the tetrarch of plotting against Rome. Antipas could not deny that he had collected a vast stock of arms; and he was stripped of all his lands and wealth, which Caligula gave to Agrippa, banishing Antipas (39) to Lugdunum, in Gaul, whither Herodias followed him. He died shortly afterward. Whether this Lugdunum be the modern St. Bertrand de Comminges, near the Spanish border, or whether the extetrarch removed from Lyons to Spain, can not be ascertained. 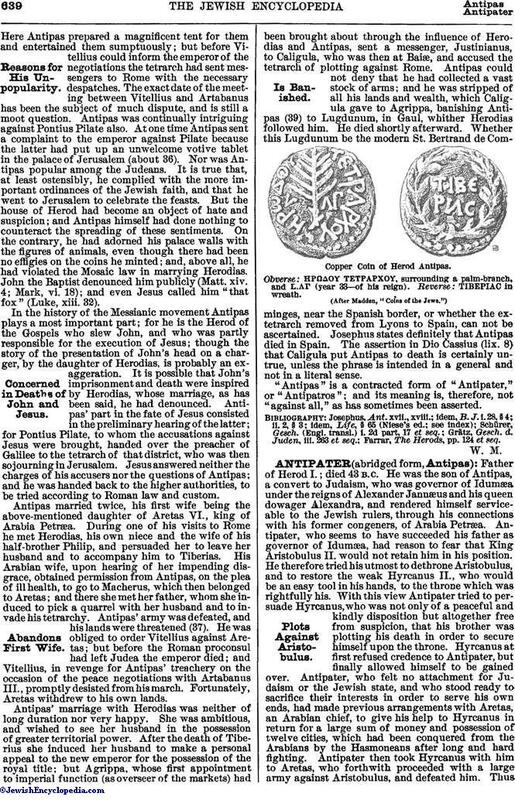 Josephus states definitely that Antipas died in Spain. The assertion in Dio Cassius (lix. 8) that Caligula put Antipas to death is certainly untrue, unless the phrase is intended in a general and not in a literal sense. Copper Coin of Herod Antipas. Obverse: ΕΡΩΔΟΥ ΤΕΤΡΑΡΧΟΥ, surrounding a palm-branch, and L.AT (year 33—of his reign). Reverse: TIBEPIAC in wreath. "Antipas" is a contracted form of "Antipater," or "Antipatros"; and its meaning is, therefore, not "against all," as has sometimes been asserted. Farrar, The Herods, pp. 124 et seq.